South Africa has a housing crisis, and informal settlements are a huge part of that crisis, explains Dr Warren Smit of the African Centre for Cities. They live in unacceptable conditions, with poor shelter and little access to services like water, electricity and sanitation. They are at risk of flooding, eviction and relocation. South Africa’s housing policy of 1994 did not address informal settlements directly. The focus was on moving people into new subsidised housing, which comes with its own ream of complexities, explains Smit. While new housing projects are necessary, initiatives such as large scale RDP-type housing projects should not become our modus operandi. They are typically developed in increasingly remote areas and do not solve the spatial divides instilled by apartheid legislation. 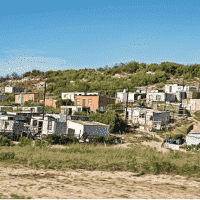 Instead, new housing developments should be accompanied by the incremental upgrading of informal settlements and should feed into national programmes that address the inequity and inaccessibility of South African cities. These ideas are presented in Upgrading Informal Settlements: A Partnership-based Approach, which Smit co-edited, co-conceptualised and contributed to together with his African Centre for Cities colleague, Liza Rose Cirolia, as well as Tristan Görgens, Mirjam van Donk and Scott Drimie from the Isandla institute. Although there are many informal settlements close to areas with economic potential, some have been confined to more marginal areas where residents are less at risk of eviction and relocation. “The danger is that if you focus in quite a reactive way on just upgrading informal settlements, you might be perpetuating some of the inequitable spatial patterns that are a legacy of our apartheid history,” says Smit. Consequently, the book examines the successes and difficulties of upgrading informal settlements within the broader push to transform urban spaces.